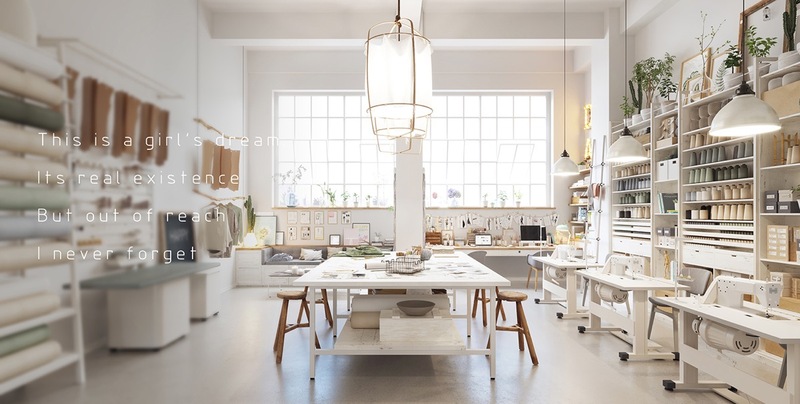 Here we have the pleasure of tiptoeing around some gorgeous creative spaces from the Chinese side of the web. 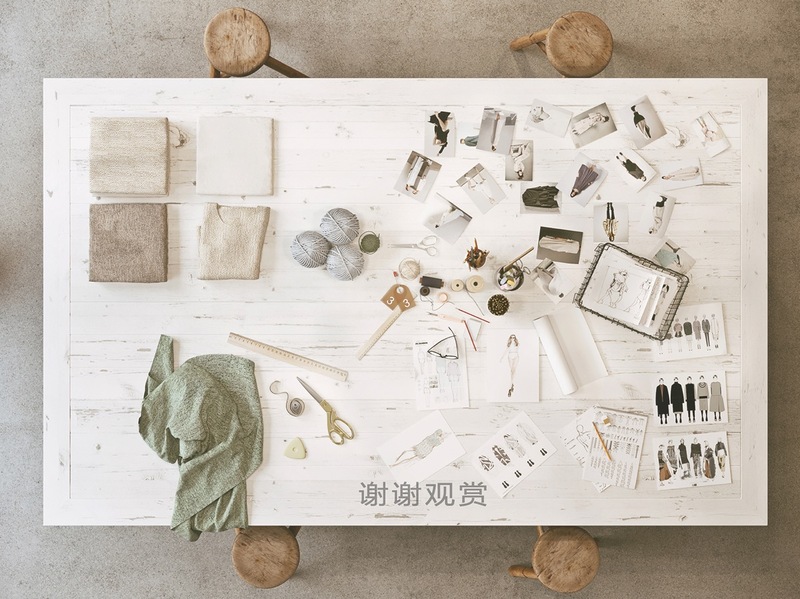 These work spaces appear to intertwine the clean and simple ethos of Scandinavian and Japanese minimalism, where natural material and clean lines are key. 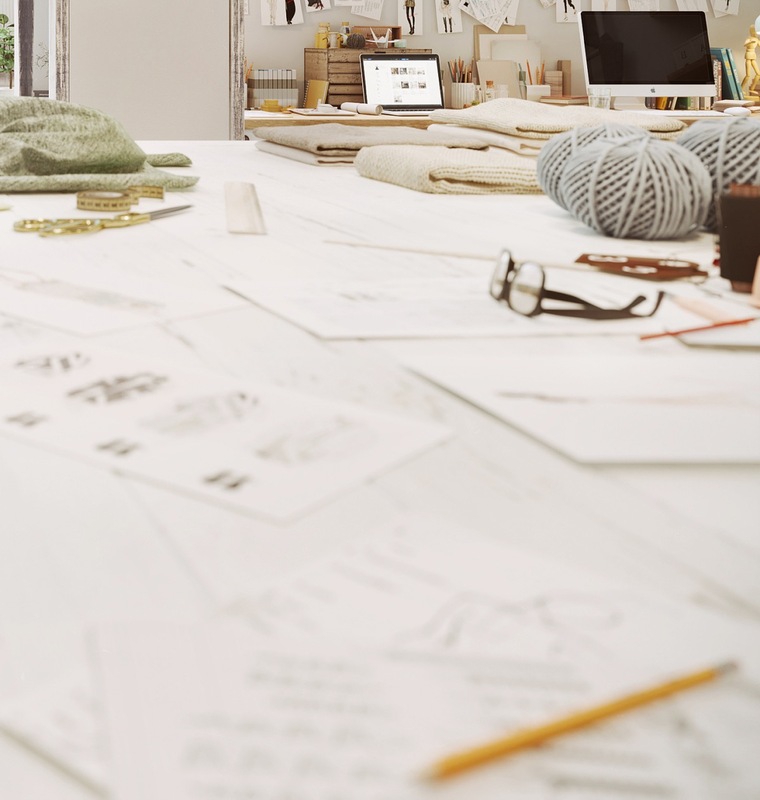 Many of us have come to accept that our own craft rooms, sewing rooms and home offices must resemble a busy scene of organised chaos (or maybe even unorganised!) but it doesn’t have to be that way. 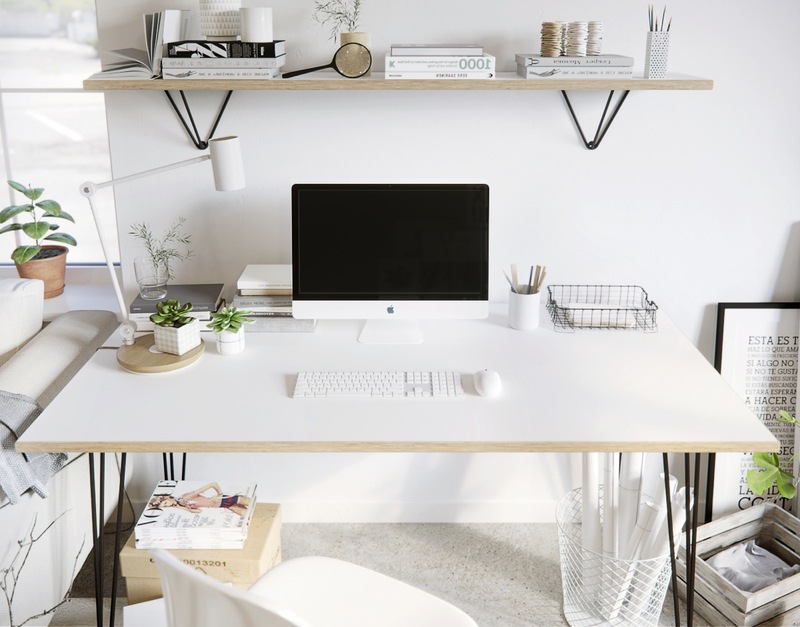 These minimalist working environments may just inspire you to cut your work clutter by utilising elegant storage and soften it all with a understated hint of nature. 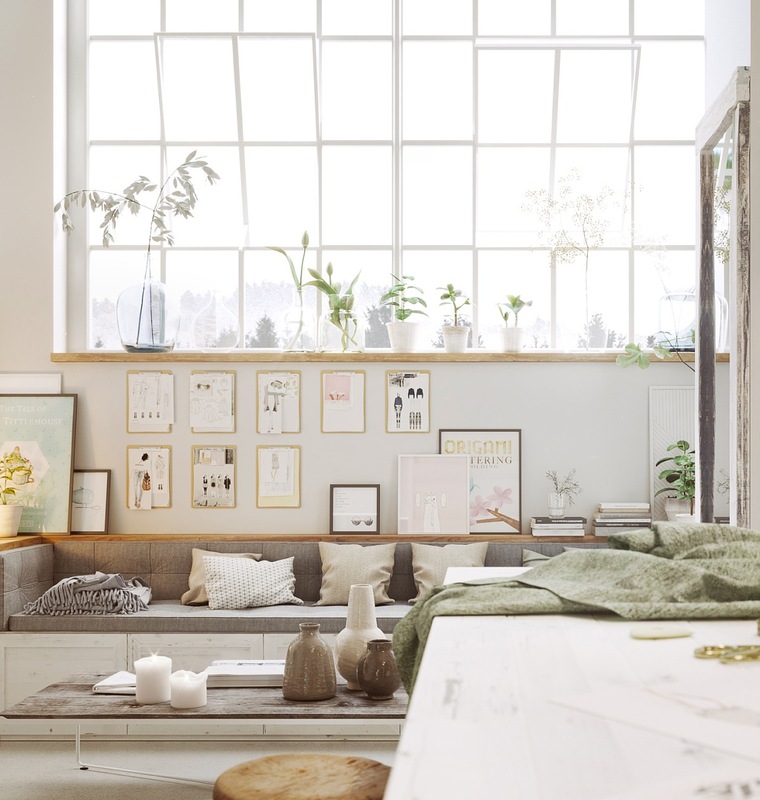 This creative studio is filled right up to its high ceilings with sewing supplies and related equipment. 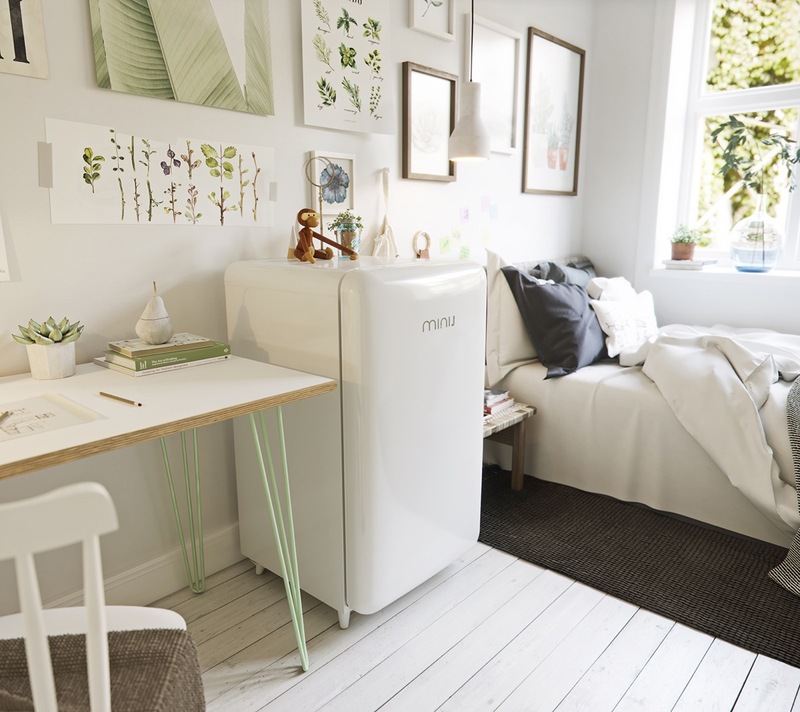 It would be easy for the sheer volume of necessary bits and pieces to overwhelm the space–and the workers who would use it. However, careful choices in storage have helped keep this a calm and organised place where creativity can reign. 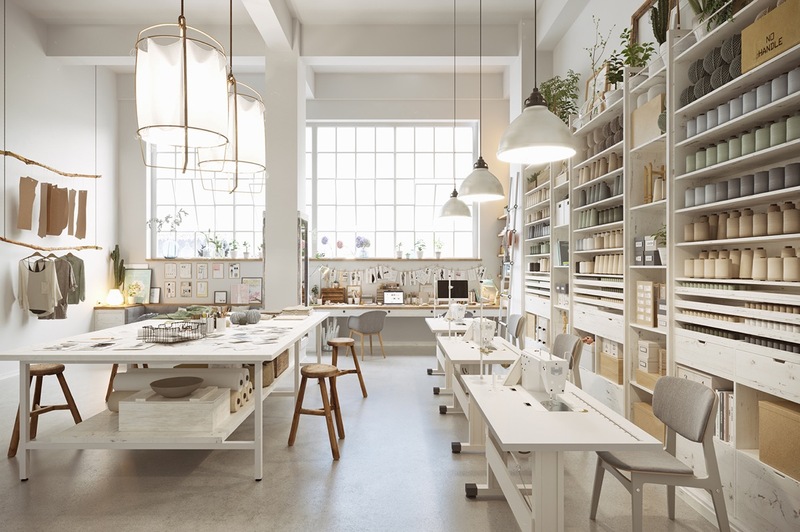 It is also worth noting the very considered implementation of task lighting in this space; simple yet attractive pendant lights hang at a practical level, eliminating the need for desk lamps or standing lights that could add unnecessary clutter to an already packed room. Also note how the top of the high shelving units are softened with a selection of plants. 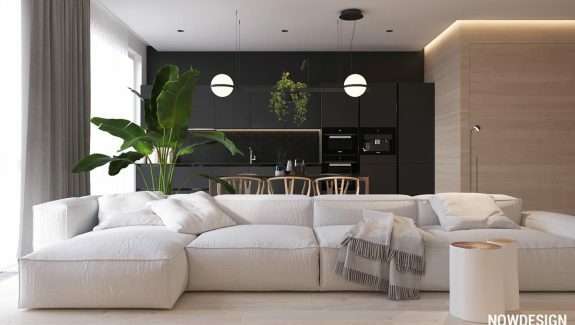 Certain common indoor plants can help filter unhealthy toxins from our air but if an indoor planting arrangement is allocated at a height not easily accessible then a selection of artificial planting may be more practical, as regular watering may become challenging. 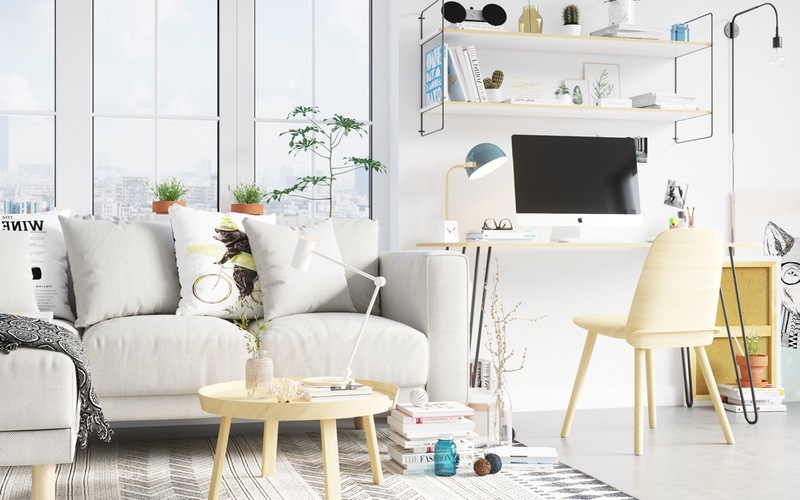 Faux greenery can still provide a positive effect on feelings of well-being. Alternatively, consider plants that require less regular watering like the cacti pictured. We can see that this studio have also installed a wall planter. 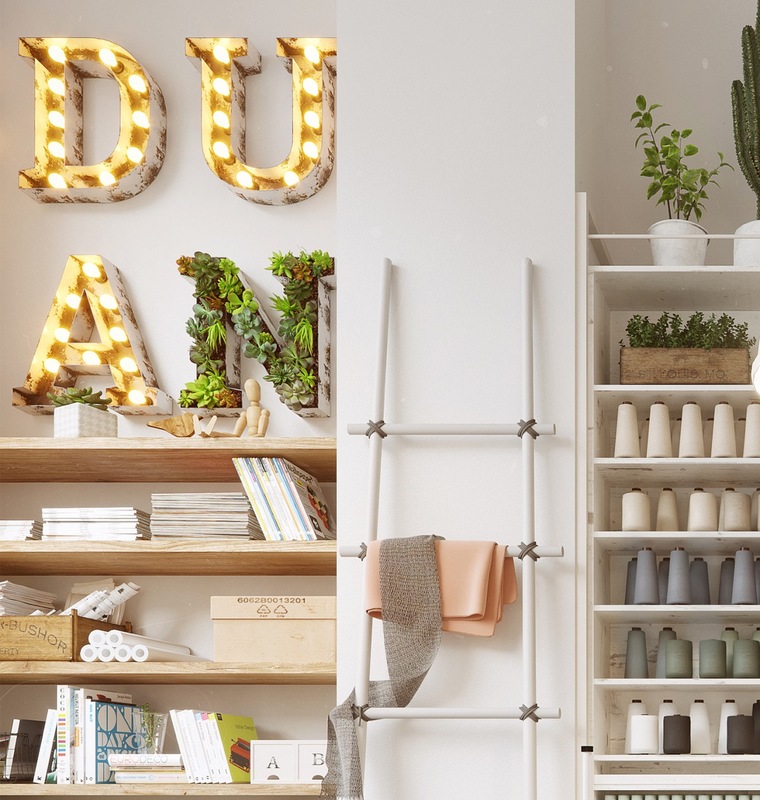 In this case it is part of a whimsical installation of carnival letters that light up a corner, with the wall planter forming the last of the letters. 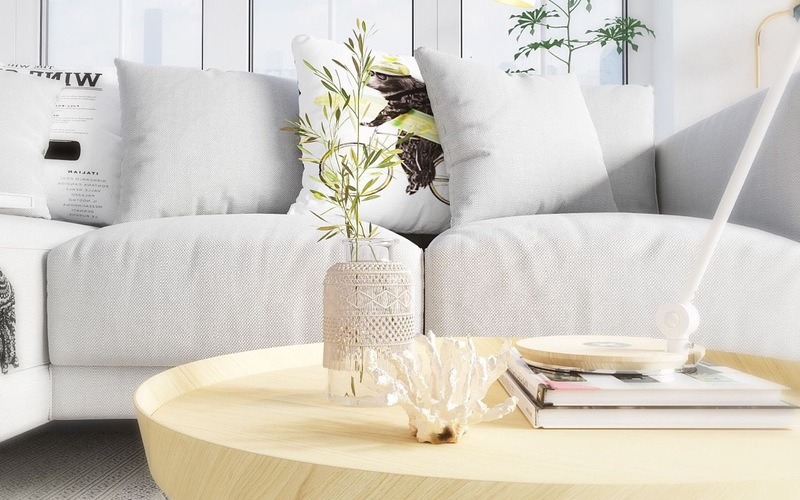 This kind of arrangement would look great in any space, perhaps even spelling out the family name in a living room or at the heart of the home in the kitchen. When storing supplies, good organization is key. Here we see that storing like with like and color coordinating creates a cohesive look. 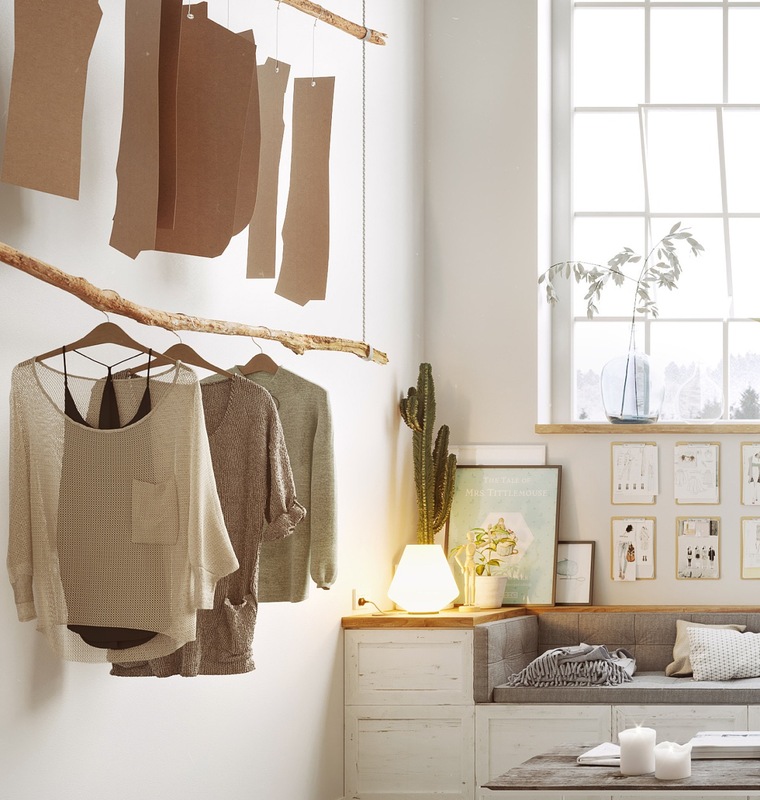 A rustic clothes rail creates a beautifully unique garment hanging area. A built-in banquet bench provides a clean line solution to seating. 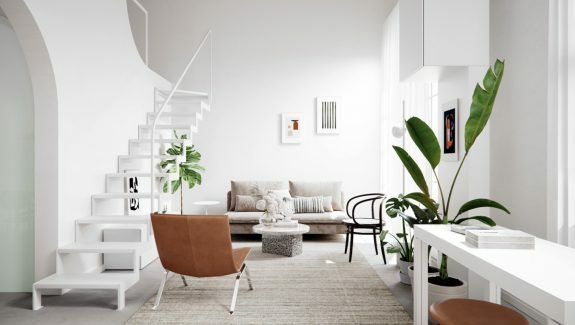 Furniture and accessories have been kept either white or in natural wood to keep the room light. Wooden frames hold botanical prints to expand upon the natural elements in the room. A simple ladder provides another option for hanging garments. 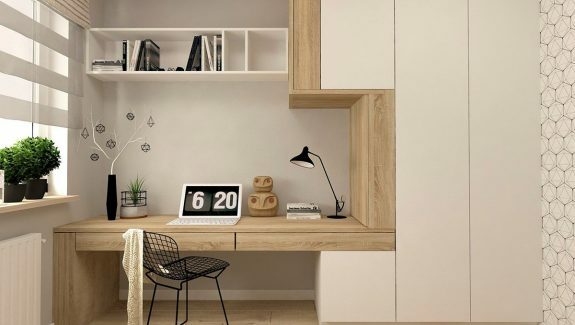 A painted desk allowing the wood grain to show through marries the clean white and natural wooden elements of the room together. The rustic stools provide an inviting place to perch and collaborate. 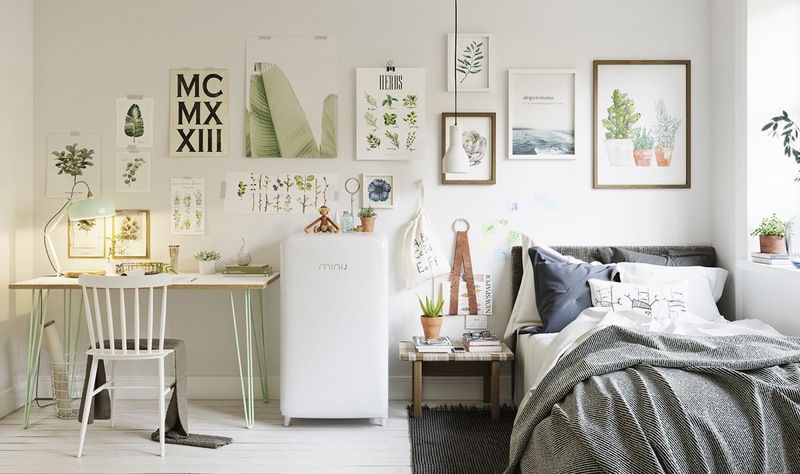 This second space also utilises a gallery of botanical prints, like these available on Amazon. The quirky hand made Rosendahl Monkey in teak and limba, designed by Kay Bojesen, adorns the top of the refrigerator. 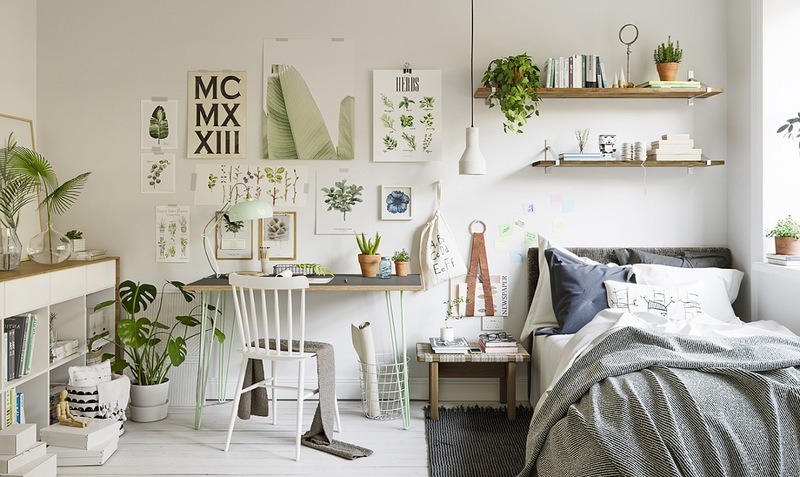 Mint green desk legs give a nod in hue to the botanical art. Indoor house plants placed across a window sill can create a garden view where one may lack beyond the glass. Small dashes of black accent pieces can help to gently anchor a light color scheme. These adorable bird figurines are a fun way of introducing another natural element to the room. 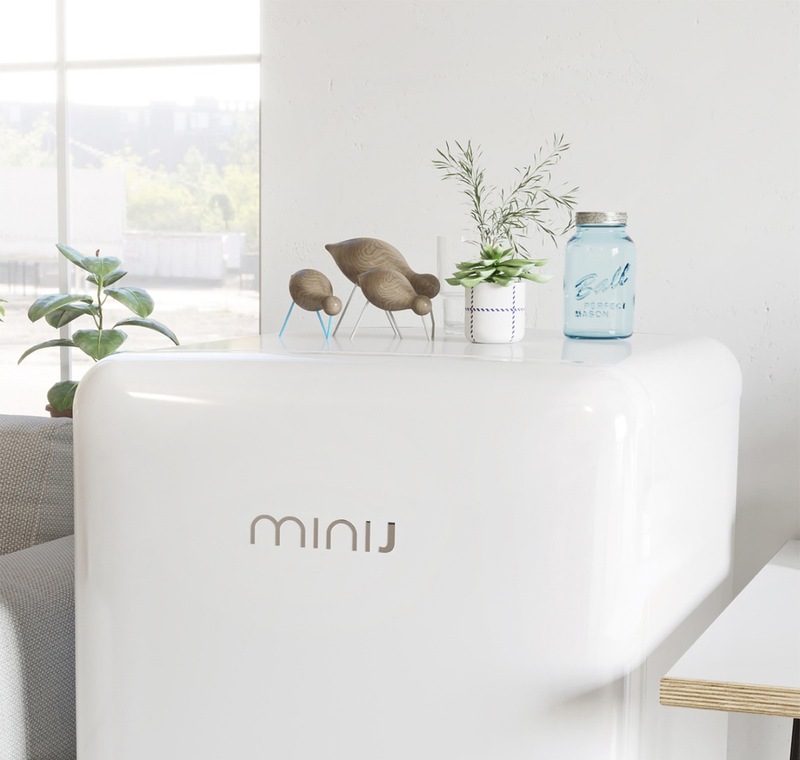 A mini fridge by your desk means cool refreshments without interruption to your workflow. 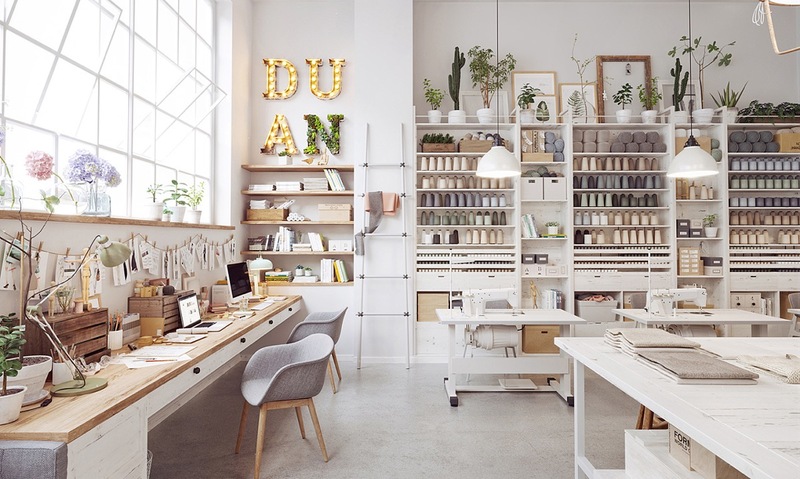 A mint green desk lamp matches the coated metal desk legs. 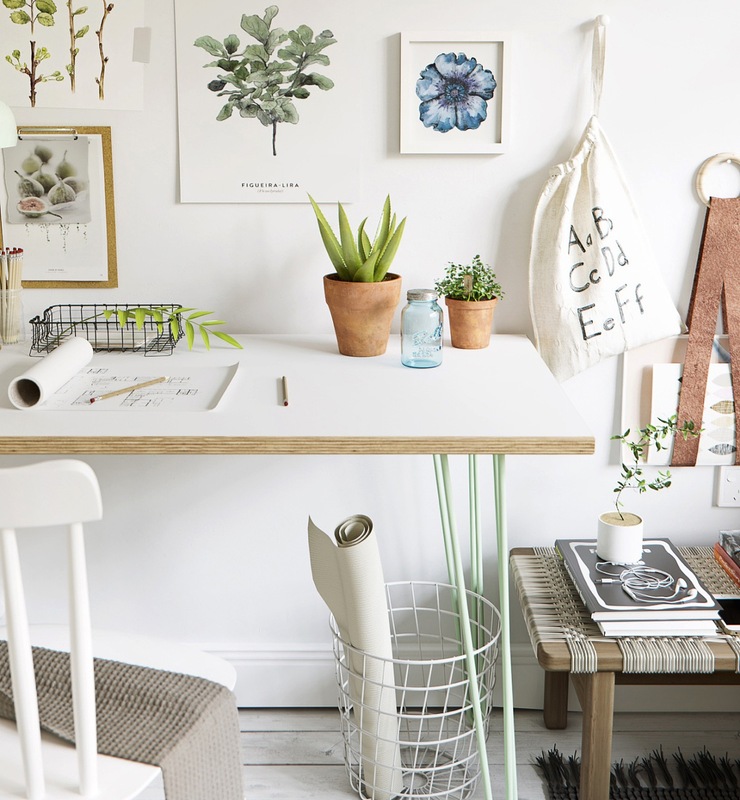 Succulent planters provide a perfect desk accessory. 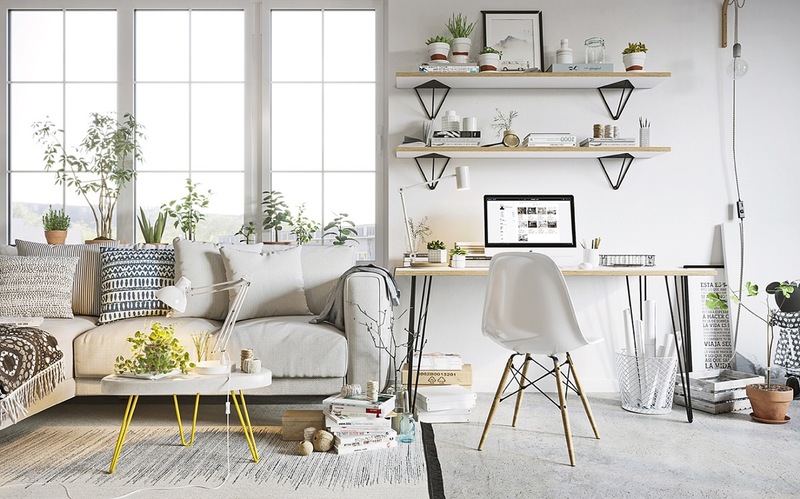 Artfully arranged shelf displays can keep a home work area looking part of the room. The desk chair in use here is the Eames Moulded Plastic Chair. Zoning of living and work areas can be achieved with the use of stylish area rugs. 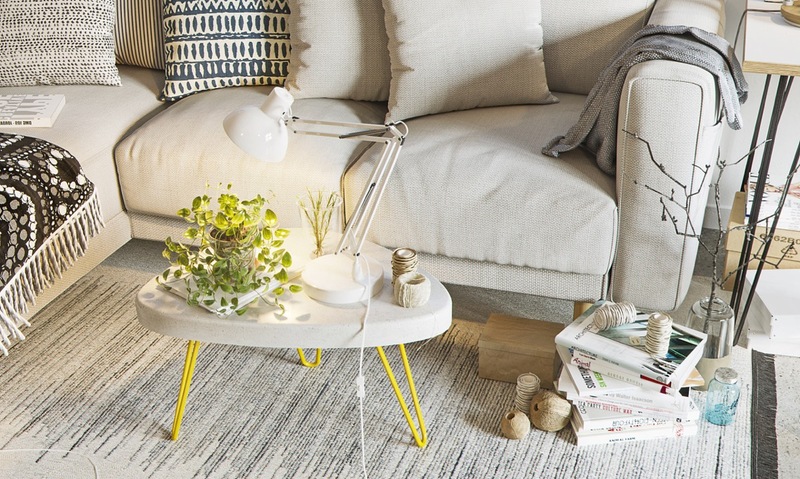 A neat and stylish table lamp provides additional lighting without becoming a distraction. This work lamp has a wireless charging station for a smartphone at its base, as well as a USB port, and is available from Amazon. Another take on the space, introducing more coffee tones. In this scheme we see the introduction of pale wooden pieces of a sturdier silhouette. 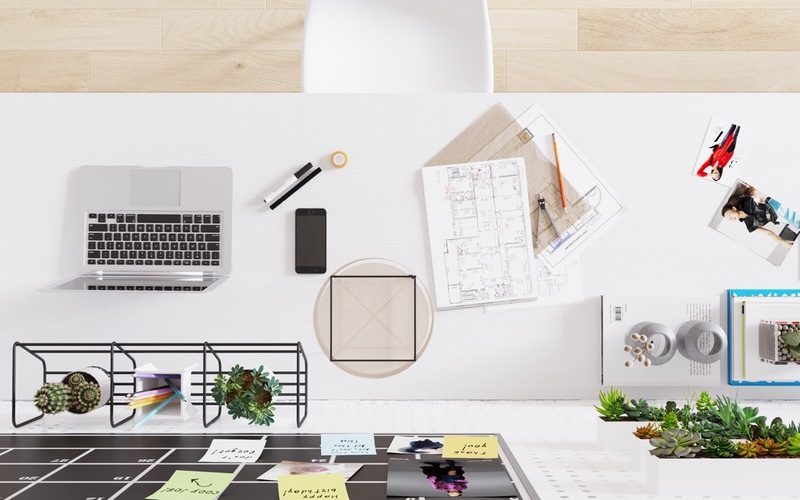 The workspace chair used here is the Muuto Nerd chair. Matching pieces marry the two zones together. The blonde wood works well against a monochrome backdrop. 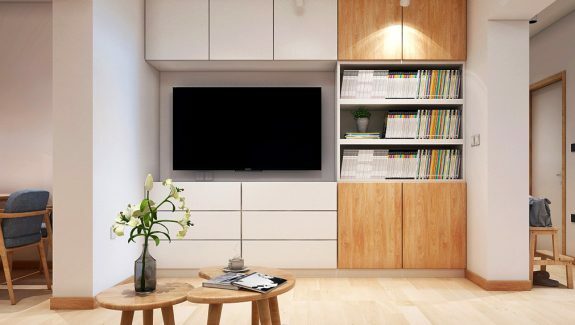 Unique wall shelves make use of the vertical space. 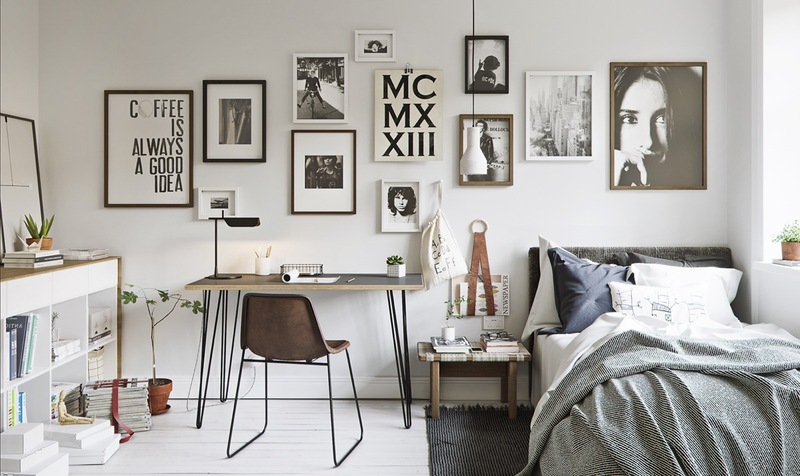 An art print propped against the wall adds further interest. 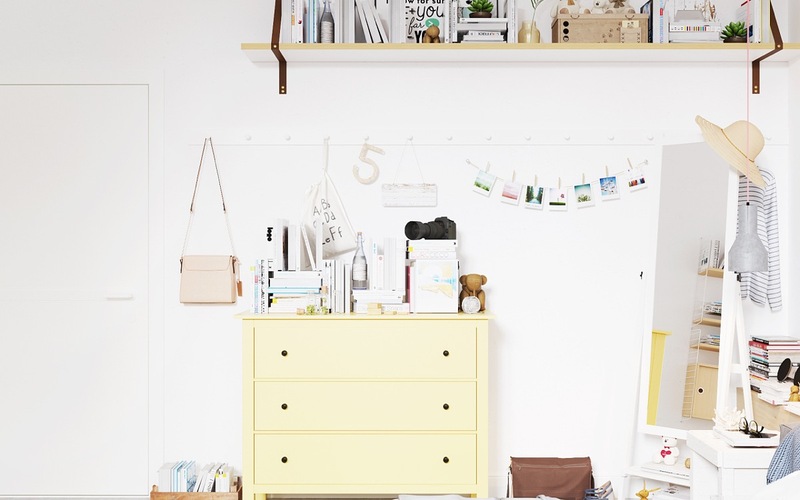 A chest of drawers can hide away both office supplies and items for the home. Unique vases are displayed in the living area. A bedroom pendant light can be used over bedside cabinets rather than having the clutter of a regular reading lamp. This space is also decorated with another of the Fox Art Prints. 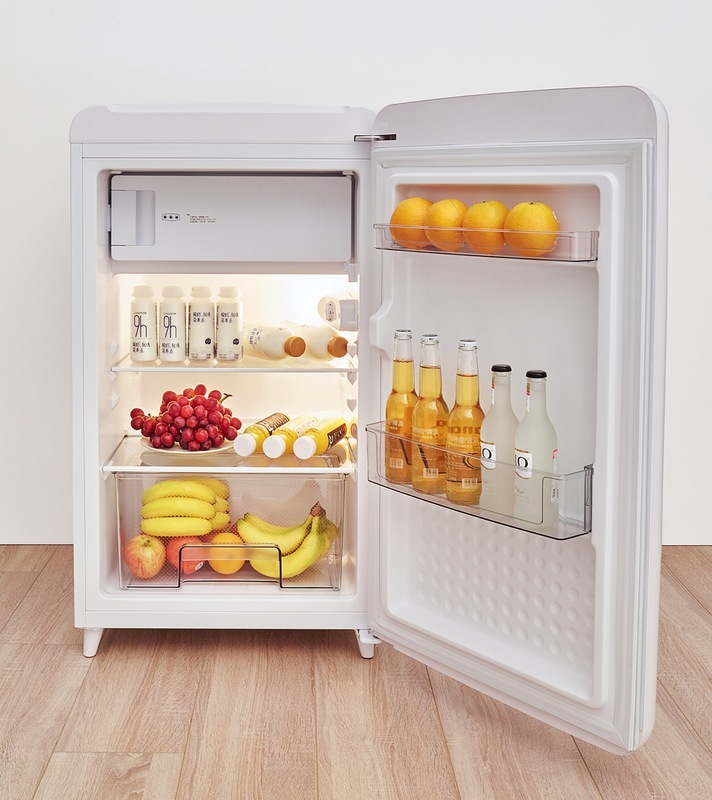 Adjustable shelving provides changeable storage solutions. 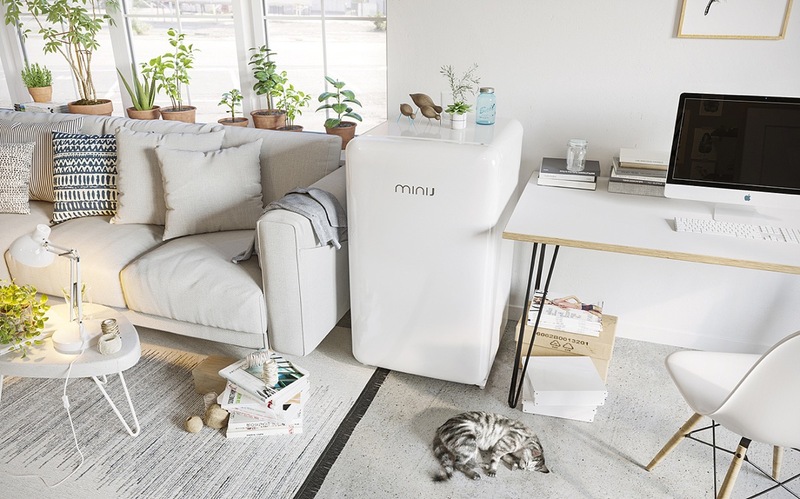 In this next space, a set of coffee tables mark a casual seating area, whilst the resident cat adopts the shelving as his own personal cat furniture! 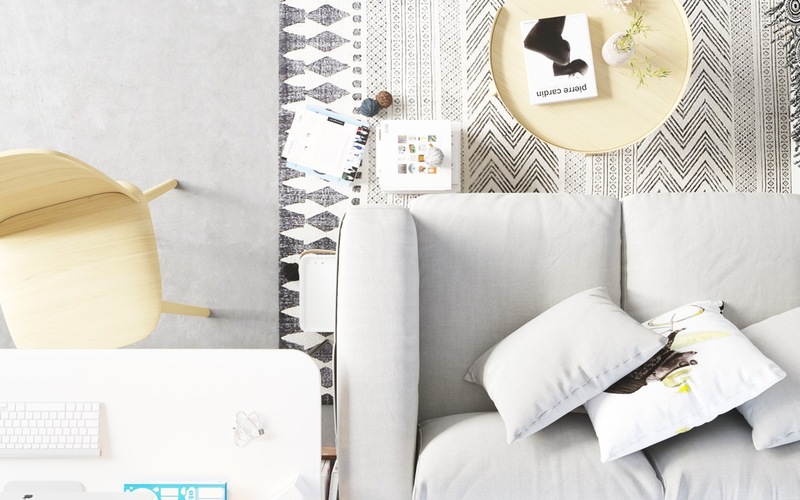 Cushions bring pattern into the scheme. 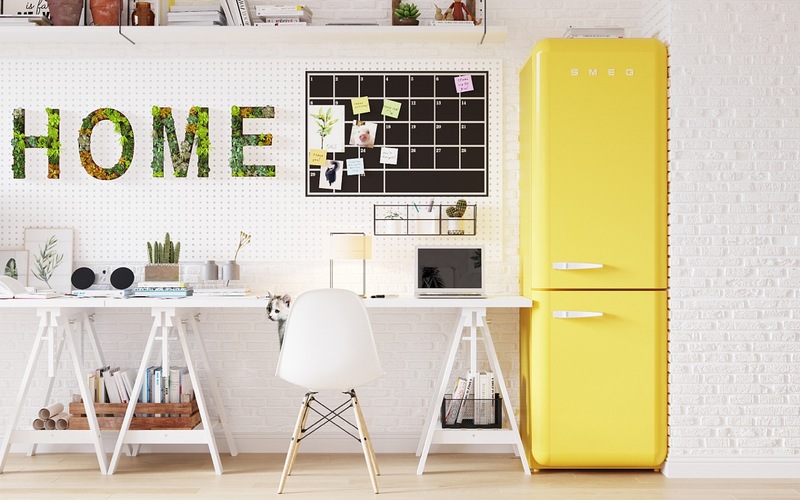 A yellow fridge adds a splash of sunshine. 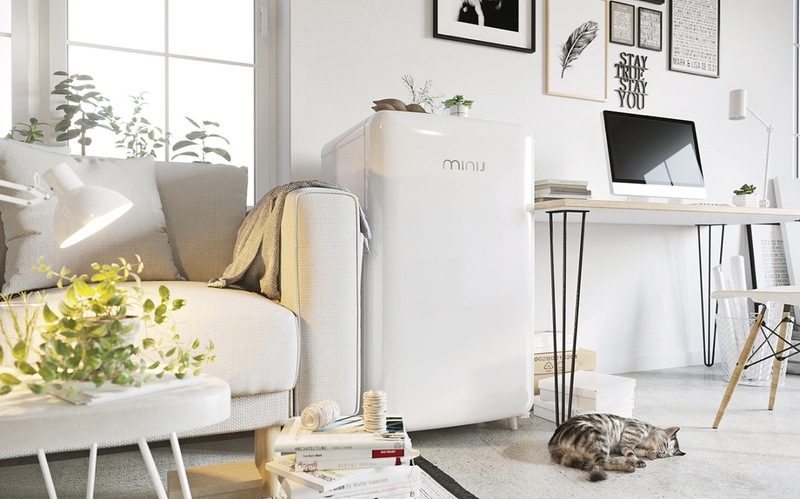 2 person workspaces are a great solution where there is more than one person requiring a place to work from home, when space is limited and rooms are limited. 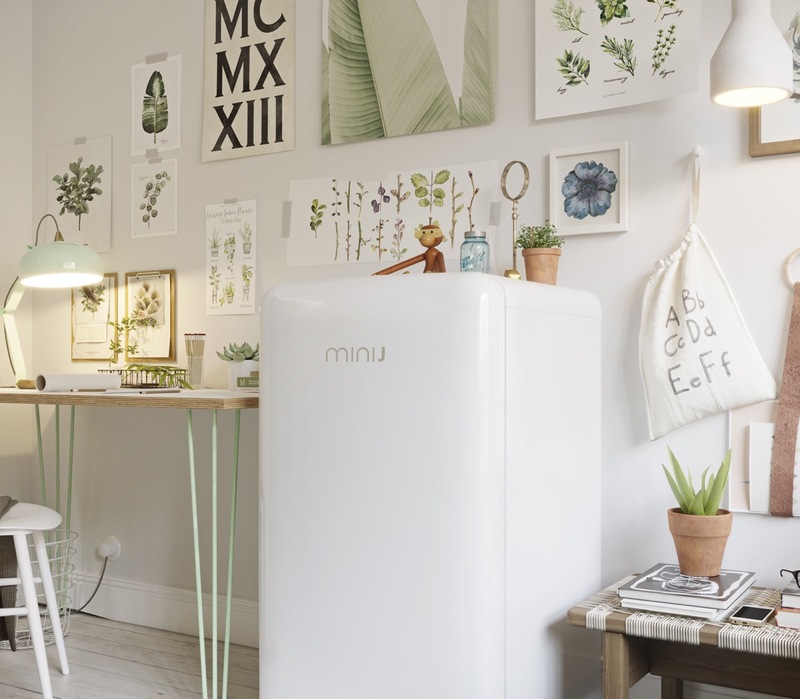 A wall rack holds plants and stationery. 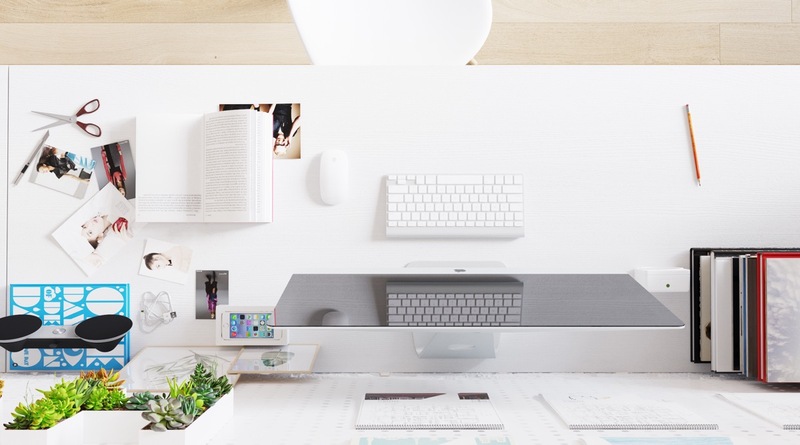 Space saving technology with hidden wires provide the perfect finish for a minimalist work space.